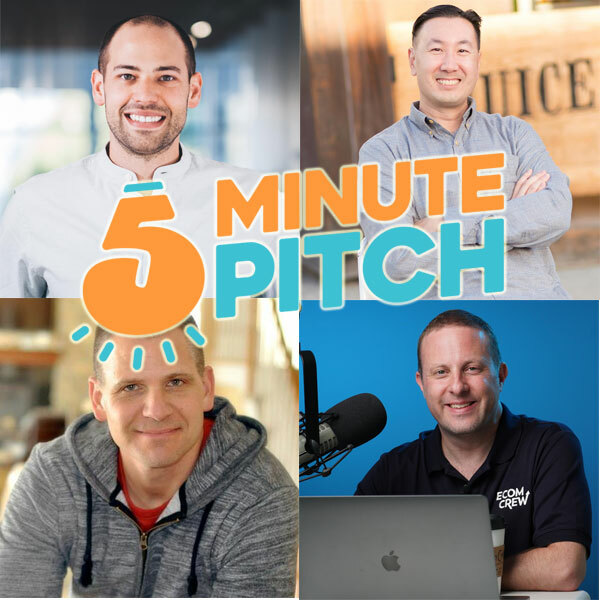 Scott Voelker of The Amazing Seller, Greg Mercer Of Jungle Scout, Mike Jackness of EcomCrew and I are launching a brand new show called The 5 Minute Pitch. What is the 5 Minute Pitch? It’s a Shark Tank like show where we’ll be giving away 50,000 dollars to one lucky business. 32 companies will be selected to pitch Greg, Scott, Mike and I and the winner will be selected on a live show with all of us. It’s going to be an awesome show and we’re going to start filming in the fall. If you are interested in submitting your business, head on over to 5MinutePitch.com. Steve: You’re listening to the My Wife Quit Her Job Podcast, the place where I bring on successful bootstrapped business owners and dig deep into what strategies they use to grow their businesses. And today I’ve got Scott Volker of the Amazing Seller, Greg Mercer of Jungle Scout, and Mike Jackness of EcomCrew to talk about a brand new show that we are all launching together this fall. It’s called the 5 Minute Pitch, and it’s a Shark Tank like show where we’ll be giving away $50,000 to one lucky business. And in today’s podcast episode, we’re going to talk about the criteria for the companies that we will be selecting along with more details about the show. But before we begin, I want to give a quick shout out to Privy who is a sponsor of the show. Privy is the tool that I use to build my email list for both my blog and my online store. Now, what does Privy do? Well, Privy is an email list growth platform and they manage all of my email capture forms. And I use Privy hand in hand with my email marketing provider. Right now I’m using Privy to display a cool wheel of fortune pop-up. Basically a user gives their email for a chance to win valuable prizes in our store. And customers love the gamification aspect of this, and when I implemented this form email sign ups increased by 131%. I also want to give a quick shout out to Klaviyo who is also a sponsor of the show. And I’m always blessed to have Klaviyo as a sponsor because they are my email marketing platform that I personally use for my e-commerce store, and I depend on them for over 30% of my revenues. Klaviyo is the only email platform out there that is specifically built for ecommerce stores and here is why it’s so powerful. Steve: Welcome to the My Wife Quit Her Job Podcast. Today I’m thrilled to have Mike Jackness, Greg Mercer, and Scotty V on the show. These three guys are my partners in crime for a brand new show that we’re starting called the 5 Minute Pitch. Now what is the 5 Minute Pitch all about? It is basically a Shark Tank like show. We will be giving away $50,000 to one lucky business. 32 companies will be selected to pitch all of us, and the winner will be selected on a live show with all of us. Anyways, in case you guys don’t know who Greg Mercer, Scott Voelker, and Mike Jackness are, we’re going to take some time today to kind of get to know the judges a little bit, their backgrounds, and how the contest works. So what up fellows? Steve: So what’s interesting about the 5 Minute Pitch is that all three of us, or all four of us, I should say, have completely different personalities and backgrounds. And so Greg, why don’t you talk about how the content is going to work and how the application process looks like? Greg: Application is open right now at 5MinutePitch.com, and it’s open to all bootstrapped online businesses. So if you’re selling physical products, or info products, or have a software company or a membership site or anything else online, and you are bootstrapped, then this competition you are eligible for. So you’re going to go online, you’re going to apply for it. We’re going to choose 32 contestants which will be narrowed down to eight. Four of those people will then fly out to pitch to us live and one winner will be chosen for the $50,000 prize. Steve: Cool. And in terms of the criteria for the people who are applying, well, that’s Scott here, what are some of the criteria that you’re looking for in some of the brands that are going to be applying? Scott: Yeah, I mean, my biggest thing is the people, right? The people behind the brand, what the mission is behind the brand. It doesn’t have to be like it has to be this fantastic like mission but it’s got to have some purpose, right? I want some purpose behind a brand that we’re going to be working with. And I think just, I want them to have some type of direction already. I want them to have some type of definitely forward motion, right? Like we want some movement, since we’re here we can turn some dials and flip some switches to make their business even better. But I want them to, number one have a story of some kind, or the reason why they decided to do this. And then from there, I also want them to have some type of plan of what they would do with that $50,000 to help them really get that extra boost. Steve: And what would you say is like the most important factor and what you’re looking for Scott in deciding on a winner, or who advances to the next round? Scott: That’s a tough one. I mean, I think the one thing like I said, is I want them to have some momentum. But also I want them to have like I can see that if they did have that 50,000, or even just 50,000 and a little bit of mentorship, which we’re also going to be giving, if I’ve seen that that’s all that they really needed, that’s what I’d be looking for. Because I mean, in all honesty, we’re looking to be able to go back to these people six months or a year and say, how did it help you, and they’re like, wow, three extra, 5X to my business. And now I’ve got this business that’s grown because of being on the show and then that little bit of help, and also that extra money. So I guess that would be it. Steve: What about you, Mike? Mike: Yeah, I mean, Scott stole my thunder, those are definitely things we’re looking for. I’m looking at some of the other people that we looked at from the previous iteration of this, when we did this with Greg. The things that I thought that were — that really shine were personality, but it’s already covered. I mean, I think that people that resonate well with the audience that’s going to be listening to this, people that are highly motivated, that put everything on the line. My favorite story from that was a guy that just received the six figure, a real estate commission and put all that into his product, just like all in and it was just like, he didn’t just like order a 500 sample size order, he ordered like a full container of his product. And he was just like, now I got to figure out how to sell those. Having some type of side story like that was really cool. One of the other people that got really deep in it was a couple that the guy was a military, ex military and military family had been moving around and stuff. And they had thought of this idea during that time. So having that is really cool. As Scott was saying, having something that you could really use our help with this. I mean, not having a company that’s already super well established. We’re not looking to invest $50,000 in the company, and own five or 10% of it, or whatever it might be. This is a gift or a grant, whatever way, which way you want to look at it. And we’re looking to help someone where this is going to make a monumental difference in their business and their lives. So those are the types of things that I would be looking for. Greg: Speaking of different personalities Steve, I’m looking for some numbers in this business. These guys are looking for the personalities behind it, and the story behind it and stuff. I want to know some numbers about your business, how you’re acquiring customers, what’s the cost per acquisition? And what are the unit economics per sales, how scalable is this, how big is the market? Those are some of the things that are going to be looking for when I’m choosing who to move on to the next round. Mike: Yeah, it’s actually a really great point. Because I remember one of the businesses that really turned me off, one of the things that turned me off when we did this before was someone that wasn’t going to disclose some stuff. So I think you got to be ultimately like pretty transparent when you’re coming in and doing something like this. Steve: So if you guys were to kind of rank based on your own personalities, the product, the team and the numbers, how would you rank those three in determining which business goes to the next round? Mike: Go ahead, I was going to say, I’ll go first. But I’ll let you go first. Scott: Go ahead. Go ahead. I don’t want to steal anything from you. Because I’ve got some things that you might like go, oh Scott, you stole it from me? Mike: I only got, I said I’m to answer one of three things here. This is a simple question, but I do think ultimately, the product is probably the most important thing. I mean, as much as people are cool, it is a business. And I think that if you have something that’s really unique, and it can become a seven or eight figure business, I think the product is probably the thing that I would pick over the other stuff. Scott: And I was going to say product. Mike: So I wasn’t stealing your thing. Scott: But I have something to add to that. I don’t think it’s just a product, I think its products. I think it’s figuring out other angles that you’re going to because sometimes you find that ceiling on that product, that you’re only going to be able to go so far. So if we can have other products in the product suite, or actually a plan of other ones that they want to add, but they can’t fund them for whatever reason, that actually is really important. Because now we can say, well, yeah, if they got two more skews in their lineup, their audience is going to want that. So yes, you have to have a good product. If it’s not a good product, like we’re not going to be like, oh, yeah, like, sure your numbers are okay. But it’s not going to work because we know that it’s a trendy thing, right? It’s a fidget spinner that’s going to go away. So it’s not just the numbers, it’s actually the product, the market trend. I think so we’re looking at those things. But like Greg said, we are going to be looking at the numbers because the numbers help us decide if there’s something that can be done here or if you take the money and you apply it that you will see growth. But yeah, I do think product is a big one. Mike: Probably the best example of how product is really important, no matter how you look at a handkerchief, you still can’t make Steve Chou cool. Greg: I’ll have to go out and say that all you guys are wrong. Scott: Oh, Greg just said we are wrong. Greg: Product is the least important out of these three. Steve: I have to agree with Greg. Greg: The numbers are the most important, then the team, then the product. I don’t care what your product is. You can have some weird membership site or some I don’t know, like weirdo physical product. I don’t care about any of that. If you’re acquiring customers for inexpensively, they have good margins, you’re making good money on all this, the market is big enough, I don’t care what your product is. And then the team is the second most important to me, because the team are the people who are able to make this work, they are the ones that are able to acquire the customers; they are the ones that are able to sell the product. So if that product were to go where they are more likely to be able to do it again. So I say Steve, numbers, team, and number three, product. Steve: Mm-hmm. For me, I always like to say that the first part — Okay, we didn’t go down the structure, right? The reason it’s called 5 Minute pitch is because we’re going to have 32 people and we’re going to limit their pitches to five minutes. And we’re going to do a hard cut off, and we’re all going to have buzzers and we basically buzz people into the next round. So for me, I would say the product is probably the most important in getting past the first round. But then once you get past that first round, I think it’s all about the people. And here is why. I think even if you have a product or the numbers aren’t that great, or they should be good, but even if they aren’t the best, I think ultimately, if you have the right people, they should be able to pivot around that problem, solve all their problems in advance. So you want people at least the way I’m going to be judging it is how flexible they are, how open minded they are to try new strategies and that sort of thing to grow their business, even though they might not have the strongest product at the present time. Scott: All right, well, wait a minute here. Wait a minute here. So, okay I’m going to challenge that Greg. So, I’m selling a fidget spinner. I’m doing awesome by the way. And that’s all I am. I’m just selling it to that audience, right? Who is the audience? I have no idea. It could be these kids spinning this thing. And yeah, I’ve got a great a great crew that can find other potential products. But I’m always chasing that product. So I don’t see the clear path. So that to me, for me personally, again, everybody’s different, that’s a little bit riskier. I’d rather say you’re going in the bass fishing market. And in that bass fishing market, I know that now and 10 years from now, I’m going to be serving that market with these different products versus saying, like, I got to figure out that next Hatchimal thing, right? So I’m not looking at the trend necessarily, like that would for me personally, I wouldn’t want to invest in that. So, I would be challenging you that on the panel, my friend. Scott: That’s true. Sorry about that. Did I say, invest? Steve: I wanted to make that clear. Scott: Okay, but if I personally was, I meant that, I meant that if I personally was taking my money and throwing it in a business that I’d be looking at those things. But anyway, go ahead Greg. Greg: What’s important to me is that a team has been able to find a niche or a product or whatever else and it has been able to make it successful. So for me personally, Steve talked about earlier, different personalities on the board, I don’t really care what your product is, or if I see that this is a long term niche that I think is going to be highly profitable or viable for long term. What’s more important to me is just that you’re making it work now and you’re the team that has assembled this and make it work. And just as a reminder everyone, we’re not just talking about physical products businesses here, info products, software companies, membership sites, any type of online businesses are eligible to pitch to us during the 5 Minute Pitch and we encourage you to do so. Steve: Cool. Mike you’ve been silent here which is unusual. Scott: He doesn’t want to get involved. Scott: So can I add one more thing? Steve: Go for it yeah. Scott: So, my thing is here too, and again, I think we’re all looking at this not just as collectively, we’re looking at it as if Greg was going in business with someone, what he look for and what would he feel comfortable in? Me personally, if I had someone that had a strong presence in a market, that’s really the first thing that I would look for, if I could choose. So, if someone already had a following, someone already had a list, I know I can sell them pretty much anything. It’s like you’re an influencer now in that space. So, if I’m in bass fishing, and I’m known for bass fishing, I know I can pretty much sell anything to anyone about bass fishing. So and I honestly think that I could personally help someone at that level. Not saying that that’s the only requirement, but I’m just looking at in that direction versus of, okay, I have a team that can go out there and build this thing. So then I know that they’ll replicate it in another market. Makes sense? Steve: So, the product doesn’t matter as much to you so much as the platform. Scott: Yeah, yeah, I guess if they’re already doing physical products, and they’re really good at it, then yeah, what Greg is saying is 100% true, right? They can adapt that to another market for sure. But I’m looking at it as like a runway for the future for this business, right. So if they’re specialized in a certain market, because that’s what they’ve been known for and they’ve spent all that time and everything into that, that shows me that they’re going to be able to just keep going down that path. Versus them pivoting and saying, okay, now I got the money I’ve already figured out over here. Now, I’m going to figure it out over here into crochet or crocheting or whatever, right. So that’s what I’m saying. That’s the difference for me. Mike: I think the thing that’s cool about like having this group and doing this is that we all look at things a little bit differently. And this is what made all the cool debates at the end. So I’m looking forward to getting the pitches and us debating at that stage of what makes a business worthy to move on to the next round at that point, or ultimately win. And a part of this, we’re also going to open it up to the audience. So, I think when it gets from down the eight people, we agree, we’re going to do a round of audience participation to get down to that final four so we have a little bit of everything. So, I think that the business that ultimately wins is going to be really well rounded is what it comes down to. They’re going to have more than one competitive advantage than kind of like, they’re not going to just have a great product, but probably a great team and also have good numbers. Greg: And a huge benefit of entering this competition, even if you’re not the one to win is you are going to get feedback from the judges along the way. It’s like, hey you know what, you weren’t selected to go on the next round, but if I was you, I would change this or that and keep doing this thing and focus more on that. So everyone gets a certain level of mentorship from the judges, even if you’re not selected to be the winner. Mike: Yeah, you also get exposure for your business. I mean, I bought a couple of the products from the Go Pitch Win stuff. I mean, they were we’re cool things. And not only — one of the products I bought just to like help them out. I was like, they’re cool. So I want to buy one. And one of them was something that I wanted myself. So you get exposure, I mean, all of us have really large audiences. And you’re going to get exposure as a business to a bunch of people as well. Greg: Actually the message I heard when I interviewed them for the winning episode, they said that their sales have been through the roof ever since the Go Pitch Win episode went live. Also another huge advantage of pitching. Steve: Yeah nice. And just a couple of notes on the application process, you will be required to submit a video. And what I encourage you guys to do is just be very natural in the video, tell your story, expose your personality, just like let it loose and act yourself. Because the applications that we will tend to accept will be those that have the most personality in addition to the product and the numbers and that sort of thing. And Greg just mentioned that he had a previous show called Go Pitch Win where the winner got a whole lot of new business. Well, that actually works for the sponsors as well. All four of us, we have large audiences. So, if you’re a company out there, or you want to sponsor this show, feel free to reach out to me or Mike at Steve@mywifequitherjob.com, because we’re going to be putting a lot of episodes out, and these are going to go to all of our four combined audiences for a lot of reach. Anything else you guys want to add? Greg, about the application process, what you guys are looking for, how to actually get chosen to be even to take part in the actual contest? Greg: Just to let you know we are recording this, this fall, starts fall of 2018. And once we’ve reached the 32 contestants for the first round, we’re going to be shutting down the application process. So, I’d encourage you guys to apply sooner rather than later, applications are currently open. Like I said, once we’ve received 32 that we really like, we’re going to shut that down. Scott: And I would just also say, if you just want to follow along, like I think Mike had mentioned, or you did Steve, you can just sign up there as well and then you’ll be notified. And this will be audio form, but it’s also going to be highly production value, also for YouTube, and any other platforms that we post the video itself. And so again, applicants, you’re going to get exposure and also sponsors, you’re going to get exposure. And I think that’s also something just to touch on really quickly, Steve, maybe you can just add not anyone can be a sponsor, right? Scott: They’re only going to have to be or they’re going to have to basically be approved by us. But they also have to be ones that we believe in, or that we’ve used or other people that we know have used. Steve: Absolutely, yeah, for the sponsors, just like normal for all of us, we’re going to be very selective about the sponsors that we choose in addition to the candidates. And one thing I will say is that we’re investing our own money into this, the $50,000 Prize. We’re hiring the camera crew, a professional crew essentially to film this and produce the podcast as well as the YouTube channel. And so it’s going to be a lot of fun. It’s actually an excuse for me to actually get out of my house and get together with these guys in person, and actually to get to know and meet all the candidates out there. One of the reasons why I run my conference Sellers Summit, is so I can ask physically go out there and meet other people, mainly because when I first got started, it was a lonely process, guys, anything else you want to add? Mike: I just want to say I’m looking forward to it. We did this with the old Go Pitch Win thing; it was a lot of fun. I already know we’re going to have fun and looking forward to doing it. Scott: Yeah, I just think that people that are listening to this episode, and that will be watching or listening in the future, you’re going to learn something too even if you aren’t at this level yet. If you’re just starting or if you’re in the beginning stages, you’re going to learn from listening to these conversations, and also just how other people started their business and how their idea became. And like I think that’s an important part because people all think that they have to know that all the numbers are perfect before they pull the trigger. And I think that you’re going to probably be surprised at how these people started their business but also got the idea to really go into business for themselves. Scott: Time in [inaudible 00:22:01]. Mike: I’m just curious why the filter on because I’m not sure I’ve ever seen that part of Steve. Like what am I missing here? Steve: So if you guys want to apply, go to 5MinutePitch.com. It’s the number 5 and then M-I-N-U-T-E-P-I-T-C-H.com. And hopefully, from listening to this episode, you get an idea of all our personalities and how we kind of evaluate things. We all have an equal vote, so depending on how you put your presentation; you might want to try to cater to all of us in our criteria for selecting the companies. Mike: One of the things we didn’t really talk about yet, talking about equal vote, you might be wondering about that since that was brought up, there’s four of us and how do we break a tiebreaker? And that’s actually, we have some guest evaluators where everyone can judge us I guess was what I was looking for coming on. We don’t know exactly who they’re going to be and we’ve already reached out to a whole bunch of them and we have commitments, but we don’t the full field now we’re down yet. But there’s some pretty cool guest judges that are going to be in here to help us break the tie, and I think that’s going to be another cool dynamic because that each week as we’re running these, there will be a different guest judge as well. Steve: Yeah, absolutely. And we’re not going to – are we going to announce those judges, the guest judges ahead of time? Probably not right? Mike: I don’t know, we’ll see. We’ll see. Scott: I think we got to figure that part out. So stay tuned. Steve: All right, so just to close, if you guys are interested in applying or just following along and getting news about the show when it comes out, go to 5MinutePitch.com. And if you are a sponsor who might be potentially interested in sponsoring this show, send me an email at Steve@mywifequitherjob.com, and I’ll send you a sponsorship packet. Hope you guys enjoyed this episode. Once again I am super excited about the brand new show that Greg, Scott, Mike, and I are releasing in the fall. And if you’re interested in pitching your company to us with the potential to win $50,000, head over to 5MinutePitch.com, that’s the number 5-M-I-N-U-T-E-P-I-T-C-H.com. For more information about this episode, go to mywifequitherjob.com/episode220.